Are you worried about whether you can do better on this test than pen and paper test? On the exam day your entire focus should be on the questions appearing on the test and not on other things regarding the computer based format. To do this, read some important tips to prepare yourself beforehand and have an AWESOME test on the exam day. Prepare Beforehand - You must take online mock tests for JEE before your exam day. CBSE website provides 4 such mock tests. You will get familiar with the few initial steps required to be done before the actual test starts. Detailed guide is provided below. Arrive early - on exam day arrive a little early so that you can relax and get familiar with the venue. Check your seat and computer - You will be using the mouse mostly but keyboard should also be working fine as you will need it to enter your roll no. Computer screen should be adjusted if you find it too bright or too dim. If you arrive early you can do all these things comfortably. Things allowed in the test - You might be allowed to take only pen or pencil in the test area. You will get everything else in the test room itself. You not might get enough rough sheets so be wise in using your rough sheets. Remain Calm - Tests are stressful but if you maintain your calm you will be able to focus on your test. If you face any difficulty with your computer equipment, room lighting or cooling or you need water etc. you must contact the invigilator. They will help. If your computer breaks down then also you will get help. 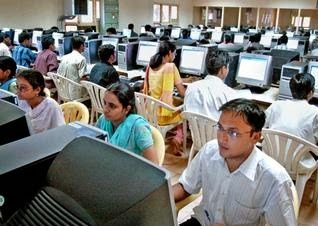 Extra computers are provided and you will not lose any time on the test because the timing is maintained by the server. Submitting your test - If you have time you must double check your answers and ensure that after pressing the "Submit" button you read all the instructions carefully so that you submit the test completely. If you are in any doubt just ask the invigilator. Login Screen - First screen will be your login screen where you will be required to enter details provided in your admit card. You will need to use the keyboard here. Check your details - After login, next screen is instructions screen where you will see your photo and name. If there is any error please get in touch with the invigilator. Instructions Screen 2 - More instructions come on this page. You will need to select your test language (between English and Hindi). You will also need to confirm that you have got a good computer by clicking a check box. When you are ready just make the selections and press "I am ready to begin", this starts the test timer. Learn where subject buttons will appear (on top) - highlighted subject is shown in dark blue color. If you are in any doubt about a question you can Mark the question for review using the button below so that you can revisit only marked questions if you are left with less time in the end. If you want your attempt on a question to be saved, you must press "Save & Next"
Option to see your profile, instructions and the entire question paper are given on the bottom right. You can avoid using them to save time. You can click the Submit button once you test is complete and carefully follow the instructions provided thereafter. Online test option gives you many benefits over a traditional pen and paper one. Most important one is that you can easily change your answer options and can easily glance through your full paper. However, one super tip that is absolutely required by everyone is remain calm and attempt your paper with full concentration.